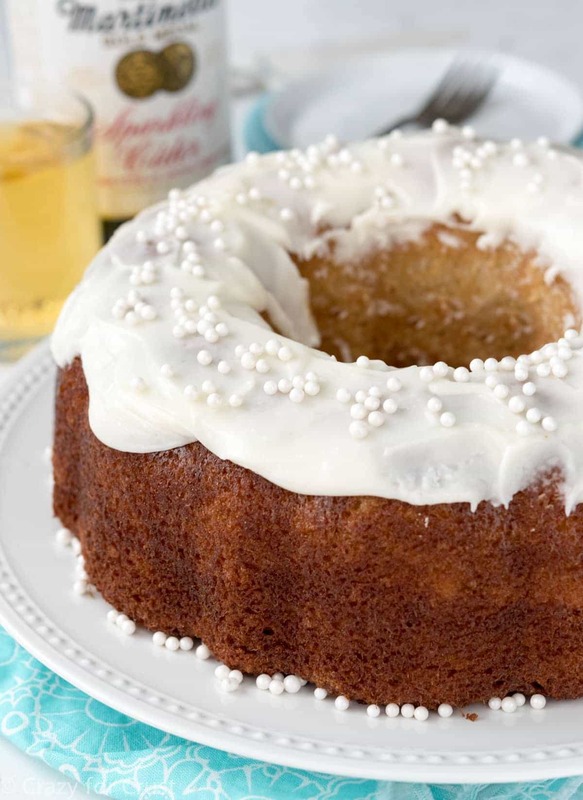 Sparkling cider bundt cake is the perfect party cake! Sparkling apple cider is added to a rich pound cake recipe, then sparkling cider frosting is added to the top. It’s delicious and festive! If you’re anything like me, you’ll have half a bottle of sparkling apple cider left over after Thanksgiving or Christmas and you’ll be wondering what to do with it. My solution: make Sparkling Cider Bundt Cake! A few weeks ago Mel said we should have a New Year’s Eve party. My mouth dropped in shock – we’re not normally party throwers. I mean, I love throwing parties, but I’m much too lazy, introverted and anti-social to actually do it most of the time. Anyway, we were trying to figure out what to do for the big night and he threw that nugget out there. I didn’t waste any time – I immediately sent out an Evite and so far, 14 people (adults and kids) are coming. !!!!! Now I need to figure out what to make and what to do for the evening. I also need to figure out how to stay up until midnight, since that hasn’t happened on New Year’s Eve in, oh, 10+ years. I’m currently perusing all my favorite blogs finding fun appetizers and drinks to serve. Do you cook new things for each party or do you stick to the same stuff time and again? I always have the best intentions to try new things, but then I end up just doing the same old things. I’d love to know some of your favorite appetizer recipes! One thing we always have at every holiday, be it Christmas, New Years, or a birthday, is sparkling apple cider. I think it’s been at every gathering my entire life, actually. Nowadays, I drink champagne whenever possible, but the kids like to feel like they’re part of the fun too, so I always serve Jordan some sparkling cider in her very own champagne glass. Then, after she drinks 1.5 glasses of the good stuff, I have over half a bottle left over. By day 2 she’s forgotten all about it and by day 3 it’s no longer fizzy…so what to do? There are actually some very delicious ways to use sparkling cider. A fellow blogger, Brianne, makes sparkling cider apple chutney. And Sandy makes Spritzy Apple Cider Floats with it. Yum! 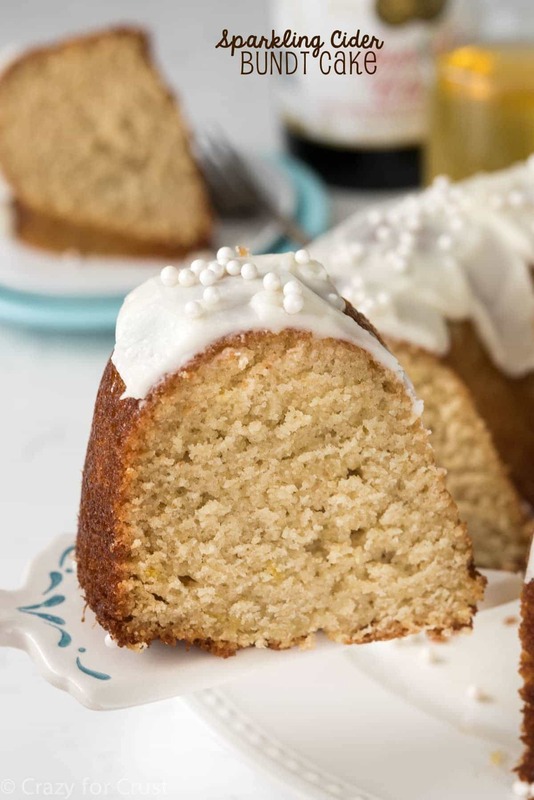 You can ALSO make this Sparkling Cider Bundt Cake recipe! 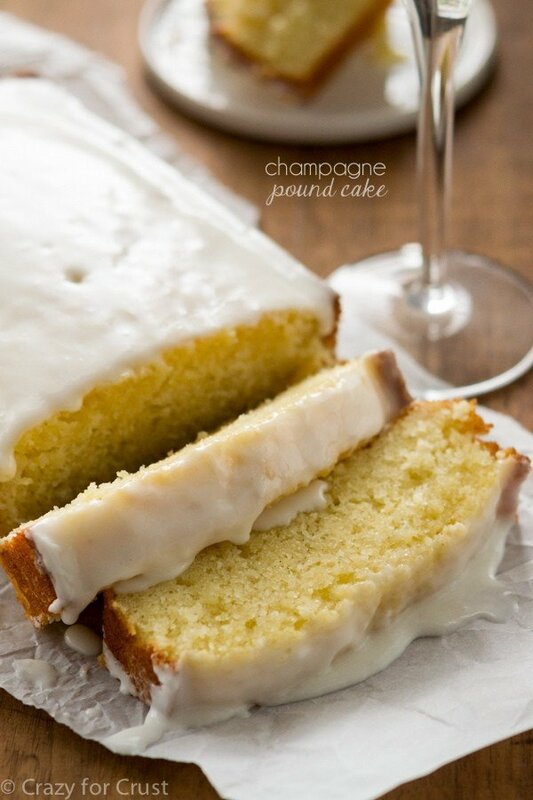 Last year I made a Champagne Pound Cake and y’all went nuts for it. I must say, it’s still one of my favorite recipes. A few weeks ago, after Thanksgiving, I had sparkling cider left over and I immediately thought, I should make that pound cake for New Year’s Eve. And I should make it a full sized bundt cake! There are three components to the sparkling cider bundt cake recipe: the cake, the glaze, and the icing. The cake is a basic pound cake recipe, except I use sparkling cider for the liquid. I also start the cake with melted butter because I love the way a liquid fat makes the final cake taste. The cake also gets it’s leavening from a combination of baking soda, baking powder, eggs, and vinegar. Those combined with the bubbles in the sparkling cider make for a very fluffy yet dense cake. While the cake is baking, I make a simple syrup glaze for it. 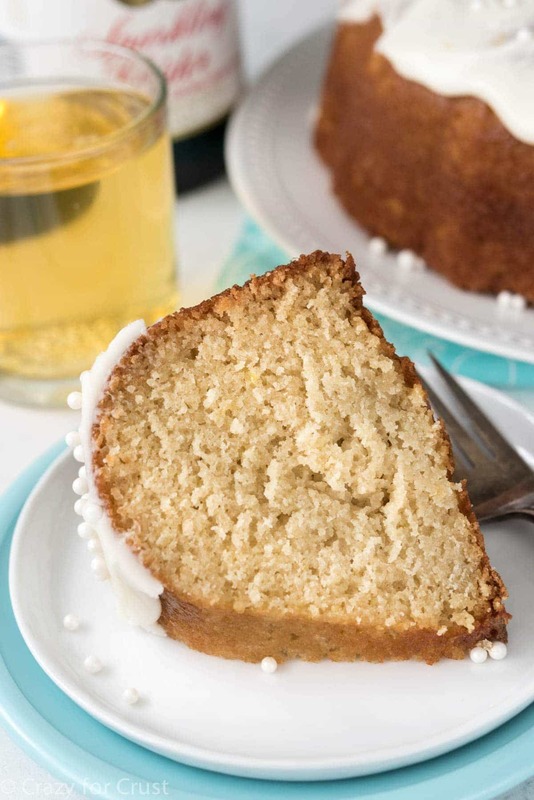 This glaze is made by boiling equal parts sparking cider and sugar to make a thick and sweet topping for the cake. You take the cake out of the pan while it’s still warm and you brush it all over with the sparkling cider glaze. 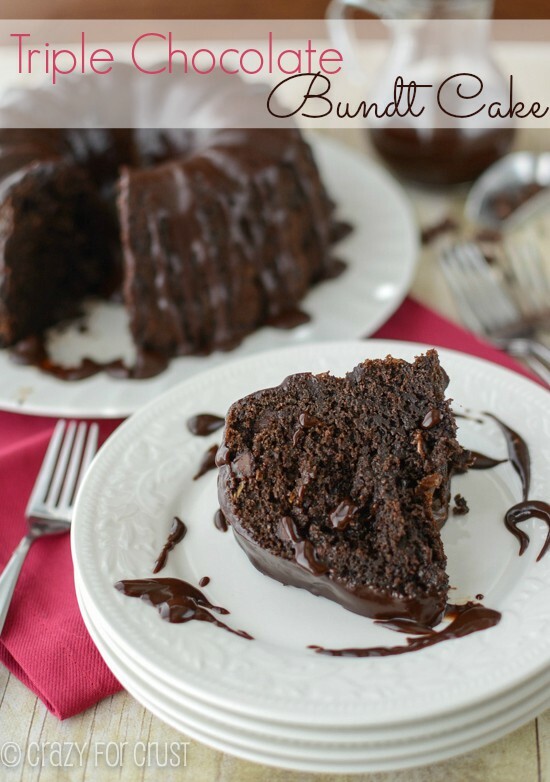 This seeps into the cake, giving it more cider flavor while adding moisture to the cake. And then, if all that wasn’t enough, the cake is frosted with a simple sparkling cider frosting, made with melted butter, powdered sugar, and more sparkling cider. The result? 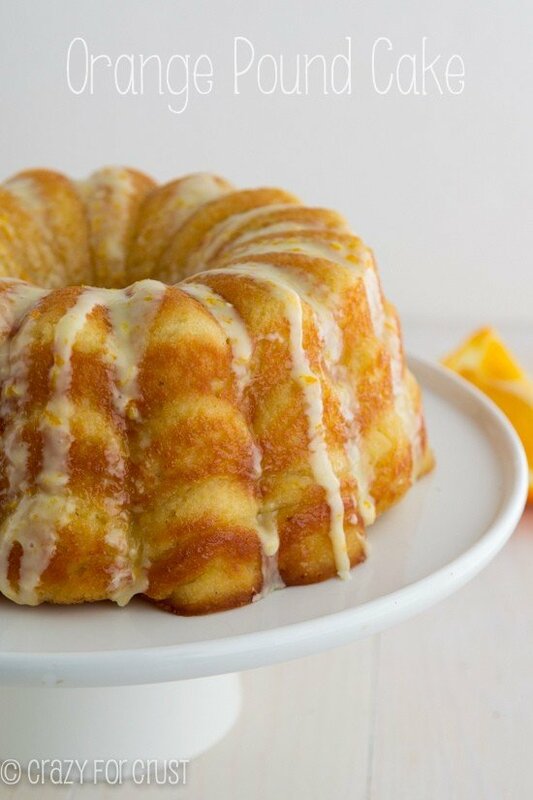 A moist bundt cake that is full to the brim with sparkling cider flavor!! Sparkling cider bundt cake is perfect for any occasion, but especially on Christmas or for New Year’s Eve. This Sparkling Cider Bundt Cake is an easy cake recipe made with Sparkling Cider in the cake, the glaze, and the frosting! It's the perfect party cake. Preheat oven to 350°F. Spray 12-cup bundt pan with nonstick cooking spray (the kind with flour) or grease and flour it. Whisk flour, baking powder, baking soda, and salt in a medium bowl. Set aside. Stir melted butter, sugar, and sour cream or Greek yogurt in a large bowl. Stir in eggs, one at a time, then stir in vanilla and white vinegar. Add sparkling cider and dry ingredients and stir just until moistened. Pour into prepared pan. Place bundt pan on a cookie sheet. Bake for 35-45 minutes, until a toothpick comes out clean. While the cake is baking, make the glaze. Heat the sugar and sparkling cider in a small saucepan over medium heat until it boils. Boil for 1 minute, then remove from heat. Cool cake for 15 minutes in the pan. Use a knife to loosen around the edges, then carefully invert the cake onto serving plate. Use a pastry brush to brush the sparkling cider glaze over the top of the cake. Let cool completely. Make the icing: whisk the melted butter, powdered sugar, and salt. Whisk in the sparking cider, starting with 1 tablespoon and adding more as needed for desired consistency. Frost cake and sprinkle with decorative sprinkles, if desired. I was looking for a way to use up the leftover bottle of sparkling cider I’ve had since the holidays…..this looks perfect! Does anyone know if it would be OK to sub out the white vinegar for apple cider vinegar? That’s all I have in the house right now. Thanks for the recipe! Can’t wait to try it out! White vinegar is totally fine!